Hatsumi's younger sister; somewhat of a floozy. She dates many boys, but eventually develops a crush on Ryoki's best friend, Subaru. 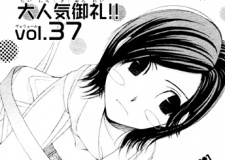 At the beginning of the series, she is a third-year student(it is mistakenly stated in earlier publications that Akane is a second-year) at a local public junior high school. She easily gets jealous and in the beginning causes her sister problems. At the end she is nice and even gives her sister advice on Ryoki.